These Candy Crush level 119 cheats and tips to show you how to beat level 119 of Candy Crush. The goal of level 119 is to bring down 1 nut in 11 moves and get at least 20,000 points. Level 119 Cheat #1: Start from the center. It’s usually easiest to find a 1st match near the center of the board (on the sides). This helps break up blockers and give you chances to make more matches afterward. These Candy Crush Dreamworld level 119 cheats and tips to show you how to beat level 119 of Candy Crush. The goal of level 119 is to bring down 1 nut and 1 cherry in 13 moves and score at least 50,000 points. Level 119 Cheat #1: Take Out the Blockers. You have to get rid of the blockers or you’ll have no moves to make and will not be able to bring down the 1 hazelnut and 1 cherry. 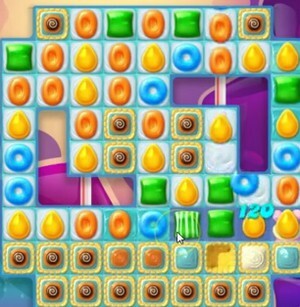 The blockers isolate all the candies in the middle of the board so making matches is impossible until they are cleared out. Level 119 Cheat #2: Work At the Bottom. A good way to attack this level is to work at the bottom (there are no blockers on the bottom row). This will help move the ingredients down as well as make cascading matches that will clear out more space. If you don’t have a move at the bottom in the beginning, either restart the level before you move, or make some space and hope matches will fall into place.